Do you remember December 2010? The UK is having heavy snowfalls, FIFA kindly thanked their biggest donors by rewarding Russia and Qatar with soccer world cups. The Aussie cricket team where in Perth where Johnson was giving the English all types of problems. Over on the east coast of Australia, Orange had a wet December. 3 times more rain this month than the average for the region. The timing was just right. The young apples were developing on the tree, plenty of rain got the apples off to a good juicy start. The new year brought sunshine. Below average rain in January and into February meant plenty of time for those apples to develop sugars. As the days grew shorter and the weather got colder in the high altitude town of Orange, the cider apple varieties came off the trees. They were pressed and the fermentation was allowed to begin with the juice still in contact with some apple flesh. As the cider goes into the secondary fermentation in the bottle, the Cat’s Pajamas were put to bed for the next 2 years only, occasionally being woken to have the lees stirred through. The Cat’s Pajamas bottles are stored upside down. The lees have worked their way down to the neck of the bottle ready to be riddle and disgorged out, all by hand. This is the key to a proper Methode Tradionelle. This makes the cider crystal clear. 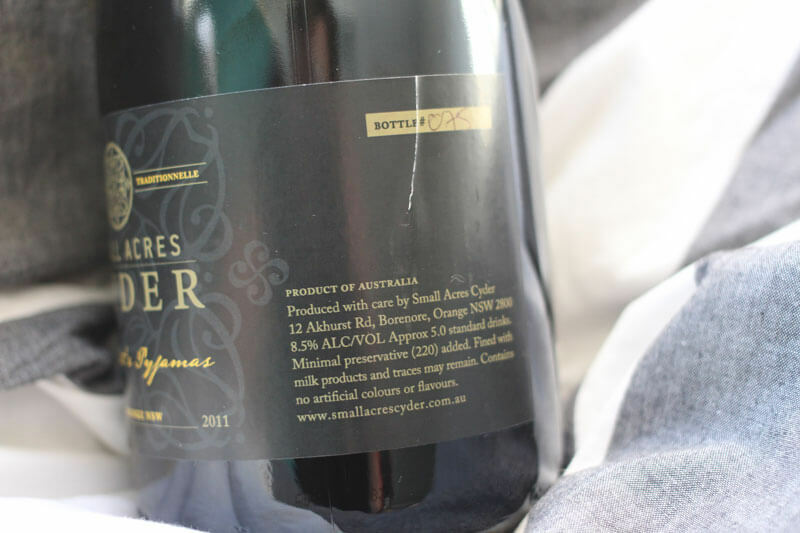 Finally, The Cat’s Pajamas is ready for the shelves just in time for the 2013 Australian Cider Awards where it won a gold in the Methode Champenoise Cider class before going on to take out the best gong for best cider in the show. I found a bottle of the 2011 vintage in my local bottle shop. This cat has slept enough. Let’s open it up. Pouring Small Acres Cat’s Pajamas into a flute glass is pouring out a mysteriously musty odor. It begs you to go deeper and find out more. Bury your nose deep into the flute, fight through the musty tones and you get hints of apples skins and luscious stewed apples. There is something special about that must, it would go well with a mouldy cheese or that smell of rain after a dry spell. I stopped and let the cider sit on my tongue for a moment. A thick creamy foam developed quickly. Everything here is perfectly balanced. A hint of sweetness, a little tannin and a little acid on a base just toasty yeast must. I’m sure this 750ml bottle was in tended to be shared. I’ve enjoyed quietly unraveling these Cat’s Pajamas with its mystery of which traditional cider apples were used and what makes up that must. I’ve enjoyed bottle number 75. Apparently its been sold out for a while, except for this one last bottle at the bottle shop. The 2013 edition is out there now. I’m sure it will be just as interesting. The 2011 is too good not to write about. This is the oldest and most expensive bottle written about here, it’s also one of the most well balanced and compelling ciders out there. Small Acre’s “The Cat’s Pajamas” is certainly not an after work drink; this is something special for a special occasion. Thanks for sharing! What a great story too.